I find the colours calming too! Strain and place under running water until completely cold. Drain well in a colander. Crush the garlic and, with a little salt, place into a small mixing bowl. Finely chop the red chilli and red onion and add to the garlic, season with pepper. Spoon in the mustard, vinegar, lime zest/juice and wheat germ. Mix well with a whisk. Pour in the hempseed oil and whisk again. Cut the avocado into two and remove the stone. Using a dessert spoon, a out the inside flesh in one go, discarding the skin. 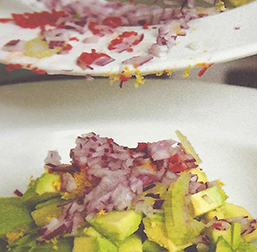 Cut the avocado into large chunks and place in the dressing to avoid discolouring. Mix the pasta and avocado together with the dressing, season to taste and serve with a tomato salad.